You know it's going to be a great day when you find 11 yards of fabric crammed into your mailbox! 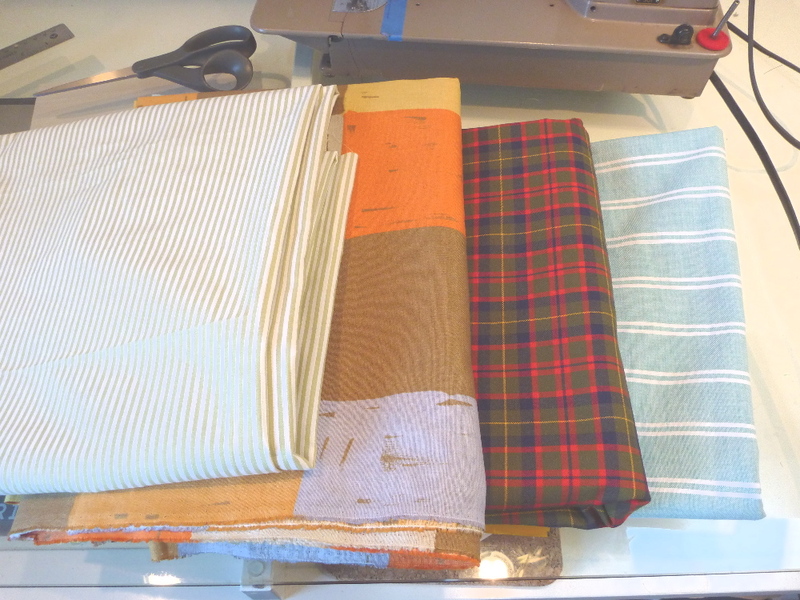 Denver Fabrics was offering free shipping, so I figured it was a good time to pick up more shirting fabric. I probably saved about $13. Admittedly, DF doesn't have the greatest photos on their website, so I was holding my breath as I ripped open the package. So here's my haul. From left to right. First is a very fine cotton shirting in celery and white. It has a wonderfully silky hand. I'll use this first and re-make the Victorian shirt with a few more alterations. Next is a block printed cotton voile. I had no idea what voile is, but I liked the print and the colors. This turns out to be my least favorite of the batch. The weave is quite coarse, like a cheap muslin. I hope it softens up with a good pre-washing. Still, I love the colors and think it will make a fun summer shirt. Next is an olive and red tartan. This is a substantial fine twill weave. Nothing flimsy about it and well worth $4.95 / yard. Lastly, a light teal and white oxford cloth. This is a color that I look particularly good in. 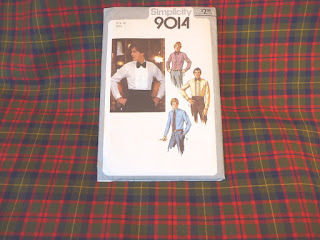 I plan on making a basic button down from the pattern that I used last year for the MPB shirt sew-along. Oh, but there's more than just fabric in the mailbox! 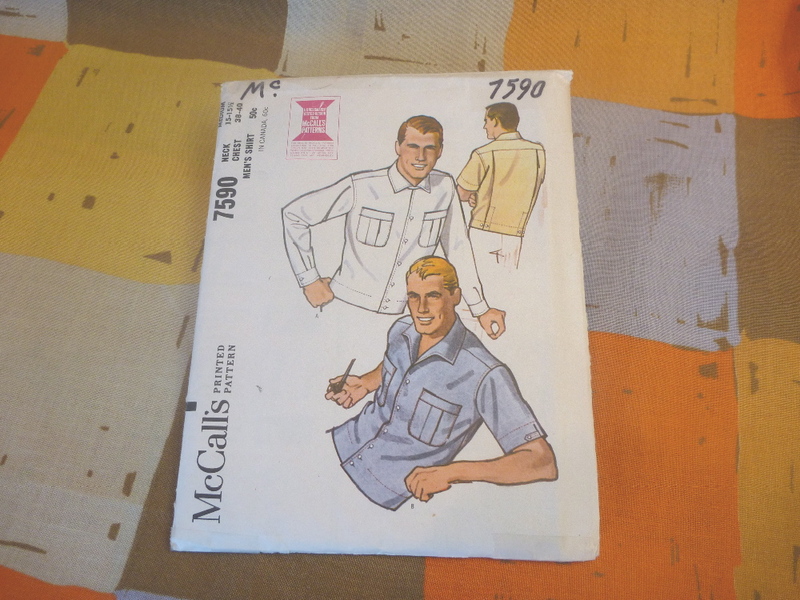 This amazing shirt pattern is dated 1964 . Thank you Sassy Cotton for finding this gem. I'm planning on using the voile for this one. I especially love the back view with the pleat and button detailing. There is also a button tab on the short sleeve. 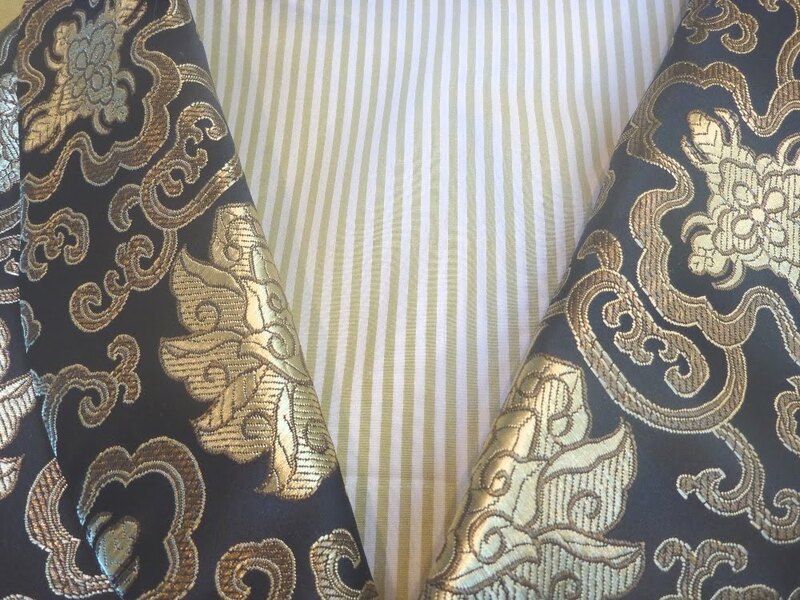 I just love this kind of detail, and it's what keeps me wanting to make my own clothes. OK. Now dial the "way-back machine" forward to 1975. This pattern is also from Sassy Cotton. 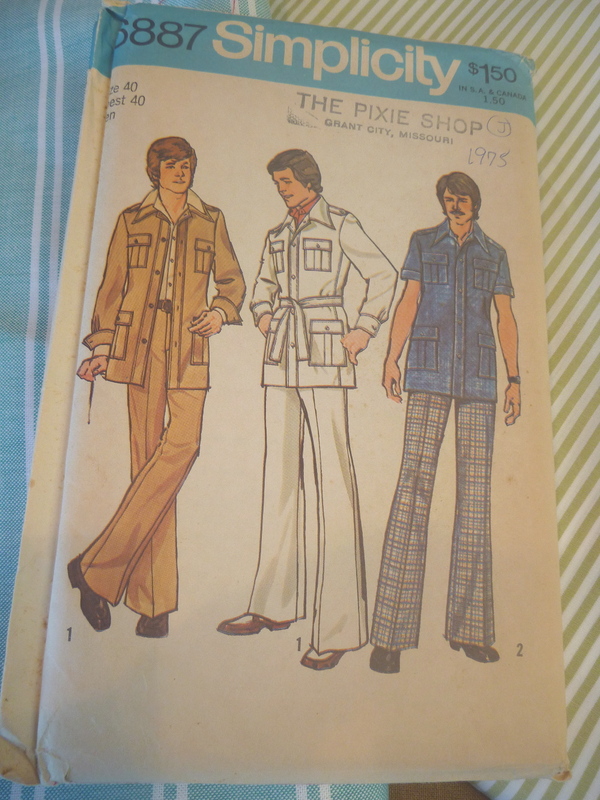 If you love vintage patterns I hope you will check out their Etsy shop. My other recent source for great patterns is Wheeler Salvage. Mary has a great selection of very stylish stuff. 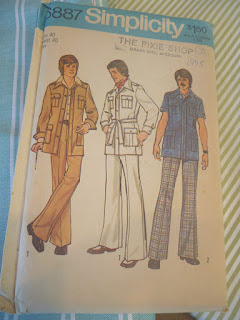 I could (and DO) look at vintage patterns for hours! I really think this whole safari look is ready for a resurgence. Do you? 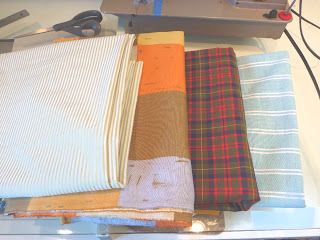 Should there be a Summer Safari Sew-Along? 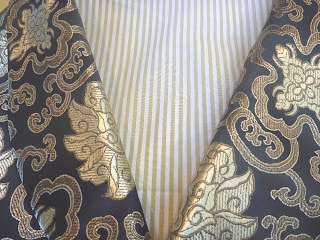 Here is the celery stripe with my brocade vest. My plan is to launch into a second version of the Victorian shirt. This time I hope to simplify the construction of the front placket by making it just a larger version of the sleeve placket. I guess time will tell if that works out. If I have enough fabric I hope to place the bib on the bias. Lastly, I'm thinking the tartan would make a most excellent tuxedo shirt. I'm not sure how the pleats work, but it could be very interesting. That's it for now. It's nice to have projects in the pipeline again. I'm not going to click on the Sassy Cotton link for now, ebay keeps me broke :-) So excited to see these works come together. Love your blog. 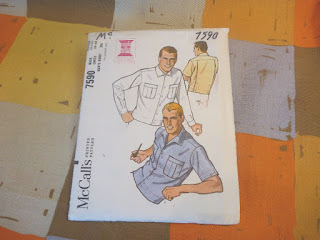 I so want that McCall's pattern for the husband! I made that fabulous safari suit pattern in a lemon yellow for a friend a few years ago. I hope you make it and I will happily do a sewalong! There has been an enormous resurgence of interest in safari suits in Australia over the past couple of years. I think you'd look great in one. What colours would you choose?